The genus Vaccinium belongs to the Ericaceae (or heather) family and includes a large number of different species. Likened to the native European species of blueberry (or bilberry), Vaccinium myrtillus, all of the various kinds of blue-fruit-bearing vaccinium (V. corymbosum, V. ashei, V. darrowii, V. angustifolium, etc.) are grouped together under the generic name ‘Blueberry’. 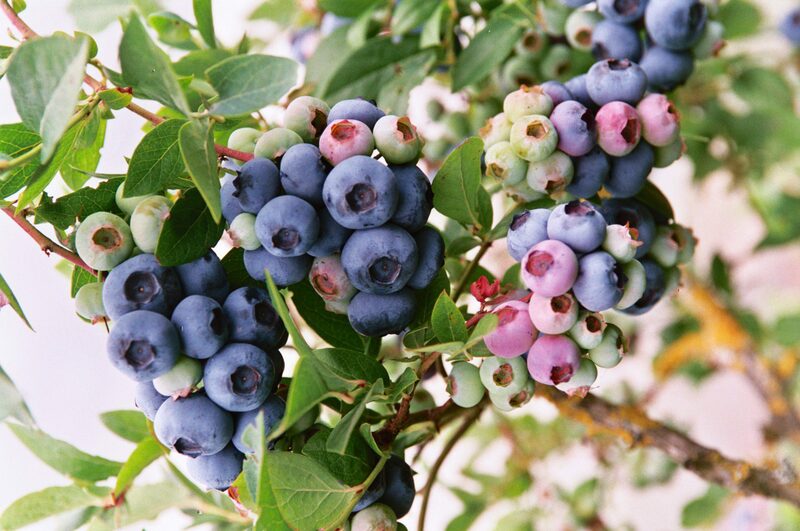 Blueberries are widely grown in North America. The Vaccinium corymbosum species (Lit: fruits in cluster) or Highbush blueberry has been cultivated in the US for around a century. This is because the original wild V. corymbosum produced the best compromise between vigour, yield and fruit quality. Vaccinium corymbosum (tetraploid), requires extensive chilling of approximately 1000 hours..
Southern Highbush: Vaccinium corymbosum hybrid, has a proportion of genetic material derived from other hot climate species (V. darrowi, V. ashei). Requires chilling of about 150-500 hours. Vaccinium asheï (hexaploid), developed principally to extend the growing season and allow later harvesting. Chilling requirements are generally low. Vaccinium angustifolium, developed essentially for mechanical harvesting and processing. It has high chilling needs. Like all the other Ericaceous, vacciniums like acid soils (optimum pH between 4.5 and 5.5), preferring soil that is well drained and generally rich in organic matter. However, some species are less demanding than others.